While the leaves slowly fade from green to orange as autumn approaches all too soon here in New England, the epic run of cyclocross races known as “Holy Week” started Wednesday evening with the Midnight Ride of Cyclocross; a tip of the hat to some guy named Paul Revere who I guess raced a long time ago or something like that. As a Category 2 cyclocross rider, Adam St. Germain, one of our long time and favorite client-athletes here at Finish Fast Cycling, competed in the single speed and both the “2/3/4” and “1/2/3” events. He was lucky enough to have a front row start for all of his races. As everyone who has ever done cyclocross knows, the start of the race is the most important. Unfortunately, if those opening seconds of the race don’t go well, you find yourself stuck in the mire of fellow racers, unable to go “faster enough” than the riders already at the front and therefore have a good score. We train our cyclocross athletes to not only go harder at the start of a race, but to also go faster. As we can see from this short section of power file, Adam was able to produce a massive amount of power and hold that power long enough to get in front of the 125 other riders in his field and stay there until the first corner, known as the “hole shot”. He then has to coast through a turn and hit the gas again up a small incline and onto the race course. This opening sprint peaked at 1100 watts and averaged 743 watts, a sprint fatigue ratio of 68% for 15 seconds and a maximum speed of 29.2 miles per hour. FROM A STAND STILL! You can see from the file that riding at the front of the race, and using the Shimano Di2 hydraulic disc brakes mounted to his Specialized Crux EVO, allowed Adam to hold his high-end applications of power for longer periods of time, helping him to avoid the energy sucking short “matches” that occur back in the field. A racer only has a finite number of these matches and staying steady in high intensity races like cyclocross is always the better strategy. 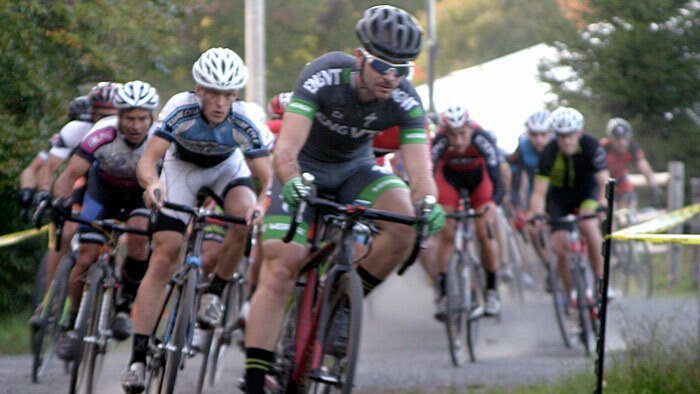 Adam attacks his fellow race companions with two laps to solo in for the win. His last 10 minutes are only effectively a tempo average effort at 272 watts, but with several short 900+ watt bursts to maintain his position. It is also important to note that after the start of the race, Adam’s heart rate only dips below 170 bpm after he has attacked for the solo ride home and is more comfortable in his position and his race tactic. The hardest part of cyclocross racing is training and conditioning the athlete to maintain what is basically a threshold level workout the entire time but with the ability to spike the power up to three times his “anaerobic capacity” over and over again to have a good race. For the next race of the evening, Adam was up against some of the best riders in the region including several professional riders and amateur national champions. Adam again had a massive start to the race, but the other equal or better riders (with fresher legs too) in the race meant more traffic going into the hole-shot and a short initial duration of power: an 1179 watt peak but only a 53% fatigue ratio, meaning he let off of the power earlier on. Now off of the winning pace and eventually finishing 9th in the elite race, Adam sees himself applying higher bursts of power more often while having to react to other riders and negotiating the course at the same time. In fact, if we were to count all of the spikes in this part of the file, we see that Adam applies power in short 3-10 second bursts worth twice his capacity levels a total of 22 times during this race. This is much more difficult and taxing an effort than the other race where he only did that effort for 13 times. The constant on-again-off-again of the pedals is exhausting and really adds to the overall effect of the race. As a coach, it is my duty to appropriately plan for these types of races. The most important skillset is for the athlete to be able to maintain those race-long overall threshold effort that are shown in the file review. He must also have the base fitness and energy system development to apply those massive short bursts repeatedly enough to constantly fight for and maintain position. My faithful readers will remember Head Case Intervals from two years ago and how that helps train the legs and mind of the racer to hit the gas often. The athlete must also do sport specific training; whether it be race starts like Adam did, or climbing or time trialing or even transition practice depending on what type of events you are doing. Adam was perfect for this event and will be again for all of his goal races this season. Great job. Those who want to check out the entire file can look here!